You know that one obstinate guy in the world who hasn’t read any of the Harry Potter books? I’m that cucumber. HARRY POTTER AND THE SORCERER’S STONE, we meet young British boy-wizard Harry Potter (Daniel Radcliffe), and tag along as his eyes are opened to the wizarding world via the school of magic called Hogwarts. 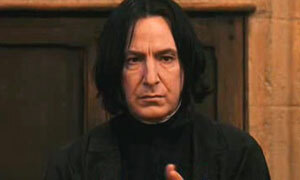 Through his wand-shaking and friend-making, he is dogged by an event in his past that brought him simultaneous fame and mortal danger – he was the only person ever spared from death by a killer wizard named Lord Voldemort, who cursed him with a scar on his forehead that looks like a backwards ‘S’ on the KISS logo. Though the movie is fresh and honest, brilliantly made by director Chris Columbus, and well-performed by the British cast, with lead actor Radcliffe embodying Harry perfectly in looks, intelligence, charm and wit, the story itself (by J.K. Rowling, transferred to the screen by Steve Kloves) is like a farm where plot holes are bred. We catch up with Harry 11 years later, being mistreated by his adopted family of Muggles (which is the wizard term for humans): Richard Griffiths as Uncle Vernon Dursley, Fiona Shaw as Aunt Petunia, and Harry Melling as spoiled, fat Dudley Dursley. Characters are all drawn quite prosaically: good is good, bad is bad. The first thing that jars us is how “evil” Uncle Vernon is, for no good reason. Why does he mistreat Harry? Does he know that Harry is a wizard? 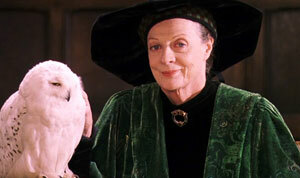 He keeps stopping an owl from delivering letters to Harry, until a backlog of millions of letters fills the air. 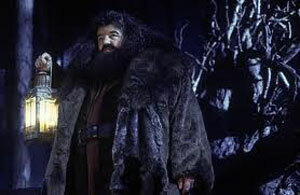 Harry runs away to a lighthouse where Hagrid meets him. He learns that a wizard named Voldemort killed his parents and let him live. Again, no compelling reason is given. Harry buys a wand from John Hurt, is bequeathed a limitless amount of money from Goblin’s Bank, and gets a white owl slave. No wonder every kid wants to be him. On the station platform 9-and-three-quarters, Harry catches a magic train to Hogwarts and meets Ron Weasley (Rupert Grint) and Hermione (Emma Watson, who would cause statutory thoughts in grown men the world over, from then to now). They were all cute little children back then; it’s a little sad looking back at this film and seeing the cast so young. 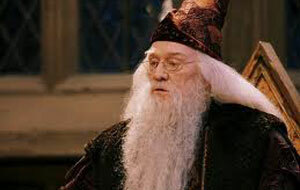 Except for Richard Harris (RIP), every cast member would reprise their roles in all upcoming sequels. The kids arrive at Hogwarts where a magic hat that looks like Ooga Booga from THE NIGHTMARE BEFORE CHRISTMAS chooses their “houses” for them – their school teams. Harry and his friends are placed in Gryffindor. We meet the troublemaking Draco Malfoy (Tom Felton), and some of the teachers, including Alan Rickman as Snape. And then – Quidditch. And we thought the pod race in PHANTOM MENACE was a waste of time. Snape bewitches Harry’s broom during this game, making us realize J.K. Rowling really didn’t think this game or this story through (see POFFY SEZ). Then it’s Christmas at Hogwarts! Yay, let’s celebrate the birth of Christ, the first true wizard and zombie! Well, ghosts regularly wander the hallways, which means there’s life after death. So why is everyone so worried about dying? Harry gets a cloak of invisibility and never once uses it to do something sensible, like raid Hermione’s room. He finds a magic mirror that shows him his dead parents, but I call foul: if ghosts are a regular thing in this universe, why can’t his parents appear to him and be done with it, instead of teasing him like apparitions in a real ghost story? Hagrid takes the kids to the forest for the one chilling moment in any HARRY POTTER film: they come upon a hooded creature drinking the blood of a dead unicorn. It is interrupted by them, and glides towards Harry along the ground. Harry’s scar hurts like Parker’s spider-sense whenever danger is near, so it’s bleeping like crazy – until a centaur saves him. Of course, a centaur. Because a mythical creature that hasn’t been foreshadowed in this story can come out of nowhere like a deus ex machina. The Sorcerer’s Stone eventually makes an appearance, and Harry must get it. Don’t ask. Lord Voldemort (he is called He Who Must Not Be Named here, but we guess that got too clunky in sequels, and he is not Ralph Fiennes but Richard Bremmer) is also trying to acquire this McGuffin. Voldy can do anything to anyone, anywhere at any time, yet he still bothers with this extra talisman; like Saruman and the One Ring, now it’s just greed, dude. For Harry to triumph, Ron must sacrifice himself in a giant chess game. He dies a horrible, noble death. Then all the emotion we spent on him goes for naught when we discover he’s alive a few minutes later. What was the point of the sacrifice? Harry finds the stone in his pocket, and is told by Dumbledore that it only appears to people who don’t want to use it. Great. Anything else you wanna make up right on the spot? SORCERER’S STONE perfectly sets the tone for the series to come – confused, illogical, senseless. Might as well just get on the train and go home. Which they do. aka: HARRY POTTER AND THE PHILOSOPHER’S STONE. Starring: Daniel Radcliffe, Emma Watson, Rupert Grint, Richard Harris, Maggie Smith, Robbie Coltrane, Fiona Shaw, Harry Melling, Richard Griffiths, Ian Hart, Warwick Davis, Verne Troyer, John Hurt, Alan Rickman, Richard Bremmer, Julie Walters, Bonnie Wright, Chris Rankin, James Phelps, Oliver Phelps, Matthew Lewis, Tom Felton, Jamie Waylett. The Extrememly Stupid Game Of Quidditch. • There’s a playing field, but you can be anywhere on or off it during the course of the game. • There are three separate balls that you score with, but all that you really need to worry about is the Golden Snitch, which is 150 points and ends the game. • There is apparently no time limit to the game until the Snitch is caught. • You can chase that Snitch anywhere in the world, on or off the Quidditch field. • There’s no referee so you can’t tell when people are cheating, and if they are cheating you can’t call them on it. • Cheating is allowed, as no one reported Snape casting spells on Harry during the game, even when they witnessed him doing it. • Anyone can attack anyone else to stop them getting the ball – not like football tackles – actual lethal attacks. • Since there’s no referee, you can’t tell whether any of the magical people in the audience are affecting any of the players or the outcome of the game. Excellent! All we need now is a national tournament without any rules. Which happens 3 movies later.